Sometimes, a dunk can be worth one point -- for the other team. If you’re sophomore Brian Rohleder, a walk-on at Kansas State who has played all of 31 minutes all season, you’re not expected to have much of an impact in the NCAA tournament. But thanks to uptight NCAA rules, Rohleder did. Having a little fun in the layup line before the Wildcats’ game against Kentucky, Rohleder threw down a two-handed dunk. That’s against the rules. No dunking right before games. Technical foul against Kansas State. Apparently, though, Rohleder came close to legally dunking. Rules say can't dunk in warmups when pregame clock reaches 20:00 K-State walkon Brian Rohleder dunked at 19:58. Kentucky’s Andrew Harrison made one of two free throws, and thus Kansas State began the game trailing 1-0. CBS commentator Greg Anthony said what a lot of people were probably thinking (via USA Today): "It’s a dumb rule, maybe one of the dumbest I’ve ever seen. Seriously. It has no impact on the game. No one even notices it and now it could cost your team a game in the NCAAs." 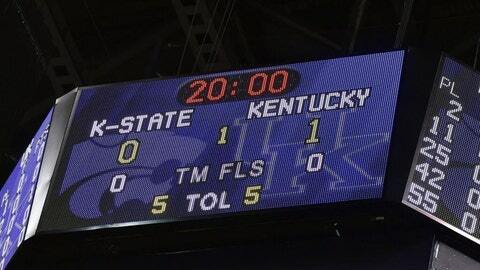 As it turned out, the one point didn’t make a difference, as Kentucky defeated K-State 56-49.